UBS this week was the latest investment firm to increase its price target for shares of Apple, with a new projection of $115 ahead of this afternoon's June quarter earnings report. 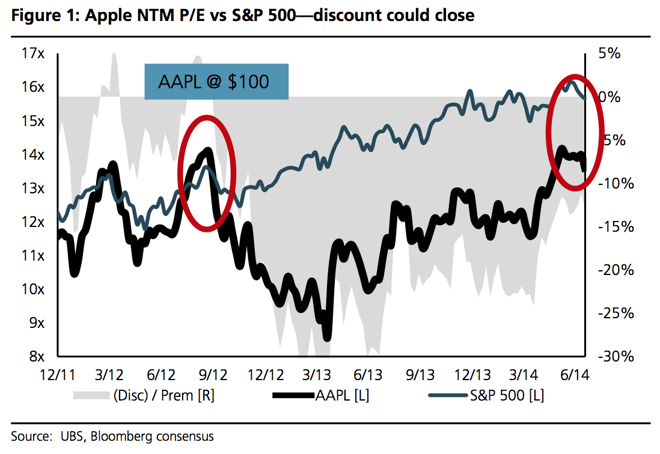 Analyst Steven Milunovich sees upside to Apple's gross margins both immediate-term and heading into 2015. For example, he cited recent data from Consumer Intelligence Research Partners which showed the high-end iPhone 5s taking a greater share of overall handset sales than the iPhone 5 did a year ago. The data also suggests that customers bought higher capacity iPhones in the June quarter —a period where customers are typically looking to save money with less storage. And finally, Milunovich noted that consumers have been embracing the full-size iPad Air, which starts at $499, which reverses a trend toward the cheaper iPad mini starting at $299 without a high-resolution Retina display. He sees Apple posting 15 percent revenue growth in fiscal 2015 to $211 billion, including sales of a rumored "iWatch." His forecast calls for the company to see a 19 percent gain in earnings per share to $7.63. Milunovich's new 12-month price target of $115 is an increase from his previous projection of $100. UBS joins a parade of investment firms that have upped their targets, with Barclays ($110), Evercore ($115), Morgan Stanley ($110), J.P. Morgan ($108), and Needham ($97) revising their projections upward in the last month alone.